The Legend of Oasis is the followup/prequel to Beyond Oasis. It was also developed by Ancient and composed by the studio’s founder Yuzo Koshiro. 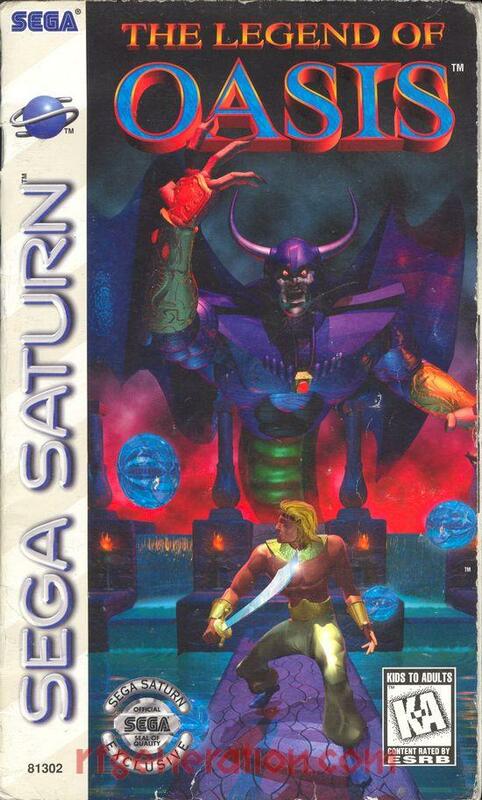 It was released in 1996 for the Sega Saturn and was built off of the same engine that powered Beyond Oasis (The Story of Thor for those outside North America). The Legend of Oasis keeps the same feeling and exploration style of the first game while introducing new puzzles and a new map. The Legend of Oasis features beautiful, hand drawn 2D art and characters and shows off the system’s 2D capabilities quite well. The first game looked great on the Genesis, and the followup also looks great on the Saturn. Despite being scored by Koshiro, the music seems to take a backseat for the most part. Its rather quiet and reserved, and there are long pauses between tracks, even when the track is on a loop. The voice samples used are of high quality and Koshiro makes good use of the available CD audio, both of which put his accomplished sound design abilities on display. In The Legend of Oasis, there are more spirits to recruit and use. On top of the original four from Beyond Oasis (Bow was renamed to Bawu for this game), there are two additional spirits, Brass and Airl. Brass has the power of sound, which can shatter crystals and break up electrical currents, and Airl has the power of air. The four returning spirits play the same roles as they did in Beyond Oasis. Bawu has some added voice samples including a chuckle when he gets bored and a sigh when he doesn’t have anything to eat. One significant change in The Legend of Oasis is that weapons no longer break, and level up by finding newer versions of them in dungeons. There are also scrolls that unlock special abilities for the weapons, and orbs which can power them. The use of food items has also changed in that now you are instantly healed when you pick them up instead of being stored as inventory items to use when you need them. Unlike the first game, there is a much greater emphasis on the dungeons instead of a more balanced mixture between dungeon diving and overworld exploration. I feel like this is a step back, given that the outdoor areas in Beyond Oasis were filled with secrets and mini games. The overworld also served as a great way to separate dungeons from each other and give the player some breathing room. In The Legend of Oasis there are dungeon entrances within the depths of other dungeons, such as Shade’s Shrine of Darkness located within Brass’ Forest of Sound. Overall, it feels like The Legend of Oasis was a step down from its Genesis predecessor. The Story of Thor series was laid to rest in only two games and ended on a rather mediocre adventure. However, one highlight of this game is that it does show you how the additional two spirits were to be used, since that weren’t in the Genesis game.